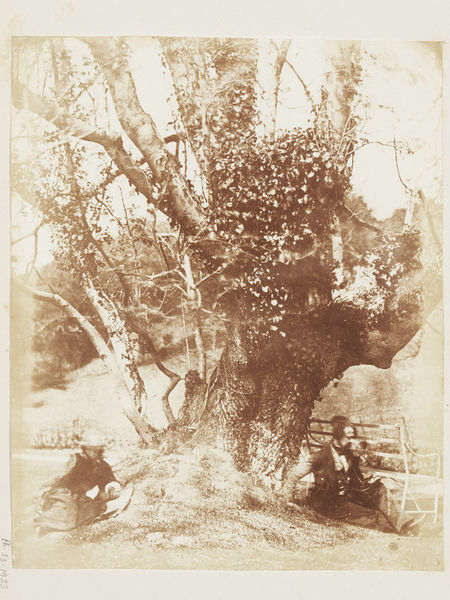 A tree portrait with two recling figures at each side of the tree, woman on the left and a man on the right. Fading to the edges of the image. During the 1830s William Henry Fox Talbot invented a way of making paper negatives and from them multiple paper prints. In doing so, he laid the foundations of modern photography. Calvert Richard Jones learned of these developments in 1839 through a neighbour, who was a cousin of Talbot. Jones made many pictures in the West of England and South Wales, where he lived. He also travelled widely, making photographs on the continent. Jones' work stands out in the early development of photography because he was one of the first to apply a schooled artist's eye to the medium. 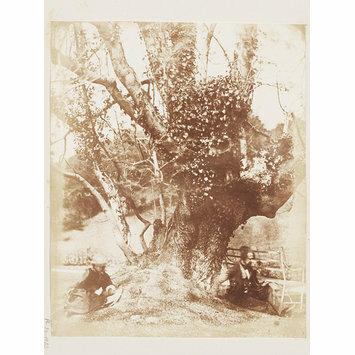 A portrait of a venerable tree, this photograph is made memorable by the symmetrically arranged, reclining figures of a man and a woman at each side of the tree. Old trees were considered picturesque in their decay and they were living reminders of the past. Jones seldom photographed trees or made plant studies, his choice of subject matter is primarily architectural or maritime.